Because there aren't enough variants of the Porsche 911 already, TechArt provides us with even more options for the rear-engined sportscar. This new GTstreet Convertible is a variant of a variant of a variant. That means they've taken a 911 Turbo Convertible (which is already a variant of a variant of the 911), and then added all their TechArt flim-flam to it. The end result is a 630 HP, AWD, 214 MPH, open-air adrenaline rush. Photo gallery and press release below the jump. 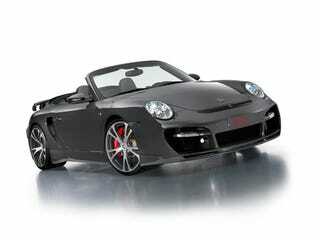 TECHART GTstreet convertible - uncompromisingly sporty. The new TECHART GTstreet is continuing this impressive trend, based on the current Porsche 911 Turbo generation. At the world premiere on 4th March 2008, this convertible model will stand alongside the GTstreet Coupé, which was officially launched in Geneva in spring 2007 and caused a real sensation.